"The Dollmaker" was twisty, suspenseful, creepy, and intriguing. The romance and the mystery are intertwined with the killer having a connection to detective Dakota Sharp's past and the killings a connection to Dakota's wife, Dr. Tessa McGowan. Dakota and Tess married after a fast courtship and separated almost as quickly. Tessa left town, heck left the country, but now she's back and her new job brings her into direct contact with Dakota. 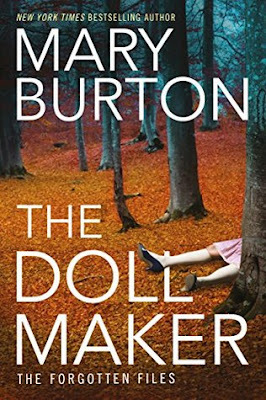 Burton spins out the story, slowly revealing facets of the characters and the mystery. While the mystery kept me engaged, the romance left me feeling ambivalent. Dakota was a good detective but had a tendency to pull away from Tessa and bury himself in his cases. While that was good for his work, it was hell on his marriage. To be honest, I found myself wishing they wouldn't get back together as he didn't seem willing to meet Tessa halfway or change at all. Tessa did all of the changing and compromising. She fought for their marriage while he kept pushing her away for her own good. I wish she'd made him grovel more. The mystery was full of coincidences but Burton made most of them believable. She took seemingly random facts or events and wove them into a cohesive whole. The killer was devious and patient and frightening. He wanted the perfect woman and was willing to invest time and money in creating her, right down to giving her a new face. I had ideas about his identity but even so, the final reveal took me by surprise. Burton threw in some twists throughout the story and kept the pace even but fast-paced. "The Dollmaker" was a suspenseful read that will keep you awake at night and eyeing your dolls suspiciously. This sounds like something I would enjoy! Does it stand alone, or do you have to read the first book in the series to get the back-story? I haven't read the first book yet (it's in my TBR pile) and it worked fine as a stand alone. Good review, Bea! The relationship you describe does sound problematic. Is the book a stand-alone? Maybe Burton will write a sequel in which Dakota makes more progress in his attitudes toward work and marriage. As for the mystery itself, it sounds well-written but, I think, too dark for me, especially right now. I'm glad you enjoyed it, though. It works fine as a stand alone; I haven't read book one yet. Dakota took baby steps toward not shutting Tessa out but really, it was Tessa getting a close up view of his work and becoming willing to cut him more slack. The mystery was well done and dark, though I've read darker. It might be too dark for you though. This sounds like an episode of Criminal Minds! Seriously creepy but I must read it! I have a few Mary Burton books but haven't read them yet. I need to get started! It would work as an episode of Criminal Minds for sure! I really like Mary Burton's books and wish I'd found her sooner. I only started reading her a couple years ago. This one sounds so good, probably one that I'd pull an all nighter reading it. I haven't read her before but I've known about her for years. I hope that my library gets this one in as they have a pretty good selection of books from Montlake Romance. That theme is beyond creepy! I get the shudders just thinking about it! Seems like it was well put together with interesting characters and I love that there was a final surprise for you. Sounds good. This might be too creepy for me!! Always nice when they make it work. I have a couple of hers from a different series somewhere around here.